Click here  to download a printable version of this page. Multifamily property owners and managers are often unaware of how their buildings’ energy performance compares to that of similar buildings. This lack of information can make them reluctant to invest in energy efficiency and, more broadly, can lead to the undervaluing of energy-efficient buildings in real estate appraisals. To address this market failure, localities across the United States are taking steps to facilitate widespread benchmarking in the multifamily sector. These initiatives encourage or require property owners to report their annual energy consumption. Increasingly, utility companies are also assisting in these efforts by providing these owners with whole-building energy consumption data. Coupled together, these efforts can help owners and managers identify energy saving opportunities and give investors, energy efficiency program administrators, and policymakers a more complete picture of local building stock energy performance. Although many localities have long targeted municipal and commercial buildings with benchmarking initiatives, they have only recently included multifamily properties in these efforts. We therefore know less about the energy savings and other effects of benchmarking for the multifamily market. This toolkit summarizes the available research focused specifically on benchmarking this sector. We include research on how benchmarking stimulates the market for efficient multifamily buildings, current policy characteristics, documented savings from programs, and recommendations for future initiatives. In addition to making multifamily building energy data more transparent, cities are adopting benchmarking policies and programs to meet goals for reducing greenhouse gas emissions (Dillingham and Badoian-Kriticos 2016). To reach these goals, cities are implementing these initiatives to increase awareness of energy waste and generate increased investments in energy efficiency (Schulte et al. 2016). These investments ultimately make cities more desirable for residents and businesses by improving quality of life, increasing property values, and adding new jobs. The US Department of Energy reports that every $1 million of energy savings yields 6.11 direct jobs, 0.95 indirect jobs, and 2.82 induced jobs (DOE 2015). Building owners, managers, and investors can use benchmarking data to understand how a building’s baseload energy consumption, and therefore its bottom-line energy costs, compare to similar buildings. Digital and automated benchmarking tools can make these complicated energy data easy to understand. The Environmental Protection Agency’s Portfolio Manager tool is the most widely known; it uses a building’s energy use intensity (EUI), typically expressed as energy used per square foot, along with building and climate characteristics to calculate a normalized ENERGY STAR® score. This score allows building owners and tenants to compare the energy use of their building against similar buildings, without having to understand complicated energy concepts. Without this information, building owners, managers, and investors struggle to accurately value efficiency improvements. For example, the city of Seattle used its benchmarking data to characterize the energy costs of its high-rise multifamily buildings. It found that the most inefficient of these properties could save $31,000 annually if its consumption improved to that of the city’s median high-rise apartment building (Seattle 2015). In this case, benchmarking allowed building owners to conceptualize how reducing energy consumption ultimately reduces operation and maintenance costs. When building energy performance is publicly disclosed, it also lets tenants factor in the energy costs of an apartment or condominium before deciding to rent or buy a unit. Property owners can thus benefit from increased demand for efficient buildings. Studies have shown that ENERGY STAR certified buildings are more marketable, command higher rental rates, and have increased asset value at resale (A Better City 2012). Building owners’ ability to benchmark their properties is often dependent on the availability of whole-building energy data from the utility. More than 60% of multifamily households pay for their individual energy costs rather than having at least some portion of those costs included in rent; as a result, these building owners are unaware of in-unit energy performance (EIA 2017). Due to privacy and confidentiality policies, utilities often do not provide individual housing unit data to building owners without first getting authorization from each tenant. This is frequently infeasible and places a burden on owners and managers, who must try to collect and enter individual tenant data themselves (Krukowski and Burr 2012). Several utilities are simplifying the process of obtaining these data for benchmarking by providing automated online aggregate whole-building data to owners while protecting customer privacy by aggregating tenant data, removing all identifying information, and restricting use of the data solely to evaluating energy efficiency (ACEEE 2014). The provision of whole-building aggregate data can enhance a utility’s relationship with multifamily customers. It lifts the burden of obtaining tenant energy data off property owners, and ensures that building energy data used for benchmarking are easily accessible. Providing this information shows multifamily customers that utility companies can be helpful partners in energy saving projects. In turn, this increases the likelihood that building owner and managers will participate in energy efficiency programs (Krukowski 2014). Commonwealth Edison provides an example of how this can work. Prior to 2008, many multifamily owners and managers in Chicago wanted to benchmark their buildings’ energy use but did not have access to whole-building usage data. In response, Commonwealth Edison created its online Energy Usage Data System (EUDS), which provides aggregate whole-building data through both an online interface and downloadable spreadsheet. EUDS has enabled high compliance rates for Chicago’s benchmarking ordinance and increased participation in the utility’s efficiency programs (DOE 2016a). Beyond increased program participation, benchmarking data can inform utility programs about buildings that should be targeted with incentives for efficiency audits and retrofits. For example, the Massachusetts Low Income Energy Affordability Network benchmarked 75% of its affordable multifamily housing stock. The program then used the data to qualify buildings for program incentives, rather than using audits as a required first step. This process ultimately saved program administrators $2.2 million by forgoing preliminary audits on all potential participants (Krukowski 2014). As seen with this example, benchmarking holds the potential to create more cost-effective energy efficiency programs. Localities have adopted both voluntary benchmarking programs and mandatory ordinances. However cities with required benchmarking ordinances have a greater number of benchmarked buildings than those with optional programs, ultimately providing a clearer picture of the sector’s energy use. 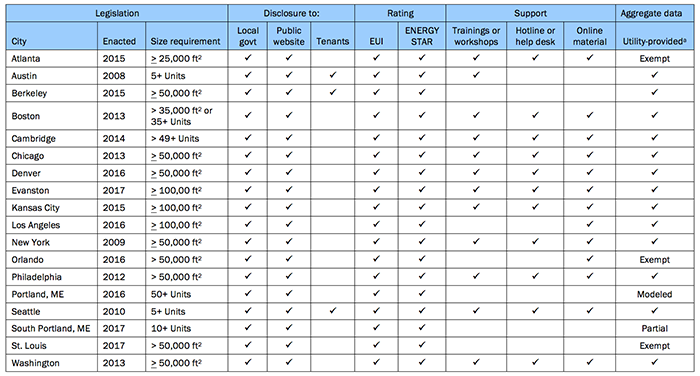 Currently, 18 cities require multifamily properties to benchmark their energy use; table 1 outlines the characteristics of their mandatory policies. a Some cities exempt owners who cannot obtain whole-building data from their utility. The following terms denote these policies. Exempt: Only master-metered buildings must comply. Partial: Must submit any available information. Modeled: Submit any available information, and use values determined by the local government for missing information. As table 1 shows, most mandatory multifamily benchmarking initiatives share common transparency requirements, create training and help centers to aid with compliance, and are complemented by access to utility-provided aggregate whole-building data. We now discuss each of these major elements. Sharing benchmarking data is essential if ordinances are to be effective. Currently, all ordinances require data disclosure to the local government and the public. At a minimum, the public can download the data from online data portals. However simply sharing benchmarking data does not guarantee energy savings. To increase investments in energy efficiency, cities must encourage owners, managers, and tenants to use benchmarking data to evaluate building performance. To engage these individuals, cities are increasingly turning to data visualization as a communication tool. Chicago (2016) provides an online map, which includes the EUI and ENERGY STAR score for each of its benchmarked buildings. The map allows the public to easily compare the energy consumption of buildings and ultimately motivates owners to increase the efficiency of their properties. Most cities provide training and help centers to assist building owners and managers with ordinance compliance. Staff members typically answer questions, facilitate communications between owners and their utility, and review accounts. The city of Seattle serves as an example of how help centers contribute to the success of benchmarking ordinances. In 2013, the city had a 99% compliance rate, the highest in the nation (Seattle 2013). The center hired Resource Media, a nonprofit communications firm, to determine the extent to which the help center contributed to this high compliance rate (Slobe and Heller 2014). After analyzing the center’s monthly logs and conducting customer interviews, the firm concluded that the help desk played a major role in boosting compliance rates and data accuracy (Slobe and Heller 2014). Utilities must dedicate resources and staff to provide multifamily properties with whole-building aggregate data, and benchmarking initiatives have played a role in driving efforts to develop this infrastructure. In many cases, utilities have agreed to provide aggregate whole-building energy data prior to the passage of a benchmarking mandate. However this is not true in all cases. For example, when Washington D.C. passed its benchmarking ordinance in 2008, local utilities did not have the capacity to provide multifamily customers with aggregate whole-building data. Consequently, owners and managers found it difficult to comply (DOE 2016c). As a result, the city facilitated a stakeholder engagement process that resulted in the Potomac Electric Power Company and Washington Gas agreeing to provide aggregate data (DOE 2016c). The city later codified this agreement in local law. As this case demonstrates, legislation can be a useful tool in getting utilities to provide aggregate usage data to multifamily buildings. Using a different approach, Salt Lake City leveraged its voluntary benchmarking policy to urge local utilities to provide aggregate multifamily building data. When the city introduced its voluntary program in January 2015, building owners said they needed whole-building energy data in order to participate (DOE 2016b). In response, city officials held a stakeholder workshop with Rocky Mountain Power and Questar Gas to discuss the issue. By September 2015, Rocky Mountain Power launched Resource Advisor, an online whole-building data access portal. Recently, the city began discussions about adopting a mandatory benchmarking policy (Salt Lake City Mayor’s Office 2017). This example shows that voluntary benchmarking programs may serve as an initial stepping stone for both encouraging utilities to provide aggregate whole-building energy and adopting a mandatory citywide policy. In 2012, the Minnesota Department of Commerce commissioned Bright Power to conduct a two-year experimental study examining the outcomes of providing the company’s benchmarking software and technical support to multifamily properties. The experiment’s treatment group received automated whole-building energy use data from utilities, a two-year subscription to Bright Power’s online EnergyScoreCards benchmarking tool, and ongoing support from a dedicated account manager to help with understanding and using benchmarking data (Woodson et al. 2015). Researchers tracked the control group’s energy use over this same period, but they did not give participants access to software or support. Ultimately, the availability of Bright Power’s EnergyScoreCards tool and support services led to a 5% reduction in master-metered multifamily building energy use. Researchers also found that benchmarking was responsible for a 90% increase in the number of treatment group multifamily buildings participating in an electric utility efficiency program. WegoWise (2017), a company providing similar benchmarking software and support, recently conducted a study of its multifamily customers with the greatest energy and cost savings from benchmarking. The company modeled the effects of energy benchmarking, advanced energy analytics, and building retrofits on the energy use, net operating incomes (NOI), and property values of multifamily buildings. The study concluded that multifamily properties have the potential to reduce energy and water use by at least 4.3% in the first year of using WegoWise’s benchmarking software and support, 8% after two years, and more than 10% over three years. For a 200-unit building with $360,000 in annual utility spending, these savings would translate into a $38,880 decrease in utility costs savings and increase in NOI, along with a $777,000 increase in property value after three years. Researchers further found that if that same property were to undergo an energy retrofit, it would save $106,200 in utility costs after three years and increase its property value by $1.23 million. As we now describe, studies such as these point to specific actions that cities, utilities, and community organizations can pursue to implement multifamily benchmarking initiatives that will increase energy efficiency. In 2015, the National Resources Defense Council’s Center for Market Innovation (CMI) guided three owners of multifamily properties receiving housing subsidies in conducting energy benchmarking and audits. CMI assisted them with overcoming multiple information, finance, and operating cost barriers. They ultimately planned retrofits that would reduce building energy use 20-30% with annual savings between $80,000 and $550,000. Payback periods ranged from three to seven years (Mann, Chi-Johnston, and Mugica 2016). As the Minnesota experiment and other successful programs show, multifamily benchmarking initiatives are more likely to lead to energy savings when accompanied by a support program with at least one or two dedicated full-time staff. These programs are most effective when they help multifamily owners and managers understand and use benchmarking data at little or no cost. A local government agency, multifamily-dedicated utility energy efficiency program, or local community organization can provide necessary support. As has been well-documented with utility-sector efficiency programs, these efforts are most successful when they streamline operations to help owners and managers identify energy saving opportunities at the building portfolio scale, help with planning for comprehensive energy efficiency retrofits, and assist with identifying needed financing or financial incentives (Johnson 2013). Enterprise Community Partners’ Sustainability Exchange initiative in Chicago assists owners of multifamily affordable housing with conducting energy and water benchmarking, audits, and retrofit projects. In collaboration with Elevate Energy, the program has led to 62% of audited units undergoing successful energy efficiency retrofits (Chicago 2016). Benchmarking ordinances and programs should consider the unique needs of affordable multifamily property owners and help them overcome challenges in using benchmarking data to pursue energy efficiency upgrades. Because owners and managers of these buildings typically have limited staff and funding, they are often the most in need of support (Mann, Chi-Johnston, and Mugica 2016; Yancey et al. 2015). These properties operate with limited capital and often have funding for energy audits, retro-commissioning, or building retrofits only during a refinance or renovation project. These projects can take several years to plan, because owners often face challenges in securing financing and obtaining the approval of current lenders, investors, and regulators. It is important that benchmarking program staff communicate with owners about energy saving and financing opportunities throughout this process. As part of its Energy Conservation Audit and Disclosure ordinance, Austin requires multifamily buildings to undergo energy audits every 10 years. At first, the city’s apartment community responded negatively to the high cost of audits. To help offset this cost, the city’s electric utility, Austin Energy, increased energy efficiency rebates for both energy audits and building upgrades by 50% for the first two years of the ordinance’s implementation and 25% for the subsequent two years. As a result, program participation increased by 200% over this period (Gomez 2014). Energy audits are an important complement to benchmarking and transparency policies and programs for multifamily buildings. While benchmarking allows local governments and utilities to identify multifamily buildings most in need of retrofits, energy audits identify specific opportunities to improve the efficiency of building equipment and systems (Krukowski 2014; Yancey et al. 2015). Energy audits can also determine which upgrades will save the most energy. Energy audits can be costly, however, so it is important that government, nonprofit, or utility retrofit programs aim to offer them at little or no cost to owners and managers. The above practices will be effective only when informed by complete and detailed energy use data. Benchmarking programs and policies should guide multifamily owners and managers in reporting complete whole-building data that include information detailing a building’s age, height, and primary heating fuel (Yancey et al. 2015). This information allows local governments to accurately project the energy savings potential for both the entire stock and specific segments of multifamily buildings. These data also help utilities determine which energy conservation measures can be offered by energy efficiency programs to improve the least-efficient buildings. The Building Energy Exchange analyzed New York City’s benchmarking data project savings for multifamily buildings. Researchers segmented buildings based on when they were constructed (before or after World War II), their primary heating fuel, and their height. Analysis of these data revealed the types of energy efficiency measures that would most benefit a building segment given its building design and fuel system (Yancey et al. 2015). Finally, research on the energy savings potential of mandatory policies has been limited. This is in part because benchmarking policies are relatively new. Cities are still learning how to analyze the effect of benchmarking on building energy savings with the available data. For example, both New York City (2016) and Chicago (2016) have reported energy savings in multifamily buildings since adopting ordinances, but it has been difficult to isolate the effect of these policies on savings. As these examples demonstrate, cities need to adopt rigorous methods for tracking and analyzing energy benchmarking data to better understand the ordinances’ potential. Until recently, multifamily property owners, tenants, cities, and utilities undervalued whole-building energy usage data because this information was not widely known or understood. This is now changing as more citywide benchmarking initiatives target multifamily buildings and stakeholders discover multiple uses for detailed and complete multifamily energy usage data. Full-time staff to help owners understand and use the energy data they collect. Assistance with securing financing or other forms of funding for building retrofits. Low- or no-cost follow-up energy audits to identify opportunities for efficiency upgrades. Guidance on collecting and reporting detailed and complete whole-building data. Energy savings in multifamily properties will increase as cities increase their benchmarking support to building owners. A Better City. 2012. Benchmarking and Disclosure: Lessons from Leading Cities. Prepared by Meister Consultants Group. Boston: A Better City. abettercity.org/docs/06.2012%20-%20Benchmarking%20report%20-%20Final.pdf . ACEEE. 2014. Best Practices for Working with Utilities to Improve Access to Energy Usage Data. Washington, DC: ACEEE. aceee.org/sector/local-policy/toolkit/utility-data-access . Chicago (City of Chicago). 2016. City of Chicago Energy Benchmarking Report 2016. Chicago: City of Chicago. cityofchicago.org/content/dam/city/progs/env/EnergyBenchmark/2016_Chicago_Energy_Benchmarking_Report.pdf . Dillingham, G., and M. Badoian-Kriticos. 2016. “Adoption of Benchmarking and Transparency Policies in the United States.” In Proceedings of the 2016 ACEEE Summer Study on Energy Efficiency in Buildings 9: 1–12. Washington, DC: ACEEE. aceee.org/files/proceedings/2016/data/papers/9_515.pdf . DOE (Department of Energy). 2015. Benchmarking and Transparency Policy and Program Impact Evaluation Handbook. Prepared by Navigant Consulting and Steven Winter Associates. Washington, DC: DOE. energy.gov/sites/prod/files/2015/05/f22/DOE%20Benchmarking%20and%20Transparency%20Policy%20and%20Program%20Impact%20Evaluation%20H....pdf . ——— . 2016a. Better Buildings Energy Data Accelerator: Commonwealth Edison Chicago Best Practices Case Study. Washington, DC: DOE. betterbuildingssolutioncenter.energy.gov/sites/default/files/attachments/Utility%20Best%20Practices%20Case%20Study%20-%20ComEd.pdf . ——— . 2016b. Better Buildings Energy Data Accelerator: Salt Lake City Stakeholder Engagement Process. Washington, DC: DOE. betterbuildingssolutioncenter.energy.gov/sites/default/files/attachments/Stakeholder%20Engagement%20Case%20Study%20-%20Salt%20Lake%20City.pdf . ——— . 2016c. Better Buildings Energy Data Accelerator: Stakeholder Engagement Strategy Guide. Washington, DC: DOE. betterbuildingssolutioncenter.energy.gov/sites/default/files/attachments/Stakeholder%20Engagement%20Strategy%20Guide.pdf . EIA (Energy Information Administration). 2017. “2015 Residential Energy Consumption Survey (RECS) Data.” eia.gov/consumption/residential/data/2015/ . Gomez, J. 2014. “Multifamily Energy Benchmarking Policies and Programs.” Presentation to the 2014 ACEEE Multifamily Energy Efficiency Programs Working Group Meeting and Workshop. Johnson, K. 2013. Apartment Hunters: Programs Searching for Energy Savings in Multifamily Buildings. Washington, DC: ACEEE. aceee.org/research-report/e13n . Krukowski, A. 2014. Creating Value from Benchmarking: A Utility Perspective. Washington, DC: IMT (Institute for Market Transformation). imt.org/uploads/resources/files/Creating_Value_From_Benchmarking_IMT.pdf . Krukowski, A., and A. Burr. 2012. Energy Transparency in the Multifamily Housing Sector: Assessing Energy Benchmarking and Disclosure Policies. Washington, DC: IMT. imt.org/uploads/resources/files/Energy_Trans_MFSector_IMT_Final.pdf . Mann, K., Chi-Johnston, C., and Y. Mugica. 2016. Capturing the Value of Energy Upgrades in Affordable Multifamily Homes: How Policy Makers Can Pave the Way to Efficiency. New York: Natural Resources Defense Council. nrdc.org/sites/default/files/energy-upgrades-affordable-multifamily-homes-policymakers.pdf . New York (City of New York). 2016. New York City’s Energy and Water Use 2013 Report. New York: City of New York. nyc.gov/html/gbee/downloads/pdf/nyc_energy_water_use_2013_report_final.pdf . Salt Lake City Mayor’s Office. 2017. “Mayor Biskupski Sends Proposed Energy Efficiency and Air Quality to City Council.” www.slcmayor.com/pressreleases/2017/1/17/mayor-biskupski-sends-proposed-energy-efficiency-and-air-quality-to-city-council . Schulte, A., M. Graham, J. Schwartz, and M. Mernick. 2016. “Leveraging DSM Programs to Deliver on the Promise of Benchmarking and Disclosure Policies.” In Proceedings of the 2016 ACEEE Summer Study on Energy Efficiency in Buildings 7: 1–12. Washington, DC: ACEEE. aceee.org/files/proceedings/2016/data/papers/7_151.pdf . Seattle (City of Seattle). 2015. Building Energy Benchmarking Analysis Report 2013 Data. Seattle: City of Seattle. seattle.gov/Documents/Departments/OSE/EBR-2013-report.pdf . Slobe, D., and G. Heller. 2014. Seattle Building Energy Benchmarking Ordinance: 2013 Technical Support Evaluation. Prepared by Resource Media. Seattle: City of Seattle. www.buildingrating.org/file/1517/download . WegoWise. 2017. Property Utility Benchmarking Report. Boston: WegoWise. blog.wegowise.com/how-to-achieve-increases-in-property-value . Woodson, C., J. Braman, J. Flisrand, W. Weber, P. Smith, and K. Tsukada. 2015. EnergyScoreCards Minnesota: Results from Energy and Water Benchmarking in 500+ Minnesota Multifamily Buildings. Prepared by Bright Power. St. Paul: Minnesota Department of Commerce. mnshi.umn.edu/projects/bright2016-mfbenchmark-final.pdf . Yancey, R., E. Abramowitz, A. Hinge, J. Perlman, C. Laver, and Y. Frank. 2015. Retrofitting Affordability: Evaluating New York City’s Multifamily Building Energy Data for Savings Opportunities. New York: Building Energy Exchange. be-exchange.org/media/BX_RetrofittingAffordability-20150618-Website-2.pdf . ENERGY STAR is a voluntary program that rates and certifies the energy efficiency of buildings and products. Table 1 details mandatory benchmarking policy provisions, but some cities have chosen to pursue voluntary benchmarking programs for multifamily buildings. For a list of cities that leverage ENERGY STAR tools, see www.energystar.gov/buildings/tools-and-resources/leverage-energy-star-legislation-and-campaigns . For Chicago’s map of benchmarked buildings, see data.cityofchicago.org/Buildings/Elevation-Benchmarks-Map/kmt9-pg57/data . It may be that master-metered building owners were the most incentivized to respond to benchmarking results in the two years of the experiment because they bore the total utility cost. The increase in efficiency program participation indicates that, given more time, other buildings may have added to this savings total. The research focused on the highest performing quartile of buildings in WegoWise’s database of more than 50,000 benchmarked multifamily buildings and 1 million units. The study incorporated operating income and expense information from the National Apartment Association 2016 Survey of Income and Expenses. Increases in property values were calculated by dividing NOIs after benchmarking by properties’ capitalization rates (calculated by dividing NOIs by property market values before benchmarking). New York City (2016) reported that the median EUI for multifamily buildings decreased 5% in the first four years following adoption of the city’s policy. The city’s published results do not account for the fact that Superstorm Sandy left many buildings and portions of buildings unoccupied in late 2012 and 2013. Additionally, the city has mandated that buildings using #6 or #4 fuel oil switch to either #2 fuel oil or natural gas. This process of switching fuels may have led multifamily buildings to upgrade to more energy-efficient equipment. Chicago (2016) reported that multifamily building ENERGY STAR scores improved by 12 points between 2015 and 2016. However the city noted that the number of reporting multifamily properties increased from 274 to 952 over this span. This is because, in 2015, only buildings greater than 250,000 ft2 were required to report; buildings between 50,000 ft2 and 250,000 ft2, which tend to be more energy efficient, began reporting the following year.